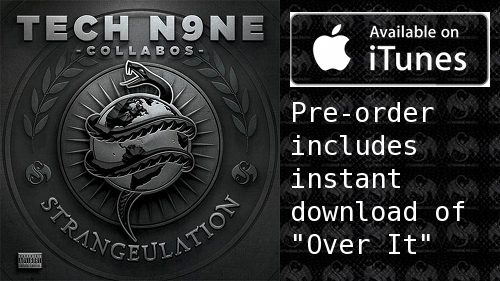 If you pre-ordered Strangeulation on iTunes you no doubt have heard the instant download song that comes with it: “Over It”. The epic anthem features a singer whose voice soars above the pounding instrumental and rings out one of the most memorable hooks to be featured out of the Snake and Bat in recent memory. Who is this crooner on the chorus? He goes by the name of Ryan Bradley from the band Above Waves out of Chicago. We recently got to talk to the self-described pop singer about his contributions to the song, his band Above Waves and how he thinks Tech N9ne and Strange Music are shaping the music industry as we speak. Tell us about the band Above Waves. How long have you guys been doing this, where do you see this going and what are your influences? Above Waves was really started by Lance Bennett and myself and my brother as well as an old friend of ours from the Chicago area. We’ve all come from very vast experiences and vast musical backgrounds, independently and with different other acts and projects we’ve been involved with. We’ve been on MTV, we’ve done the VH1 – the big media. We’ve done radio. We all have a lot of experience and I say we’re battle hardened, but what we all have in common is that we just love pop music. When we were able to kind of get together and conceptualize this it was really great. It was natural. There was no pressure there. We just wanted to make the best songs that we could and we’re still in the process of that. We’ve got some really big things coming here in the future really quick. I have a good feeling and can confidently say that people are going to start hearing this name. We’re going to take it to the road and we’re going to take it to the airwaves. This is a new project man and for us it’s just about the songs, the songwriting and putting all our experiences into this thing and really driving it. We’re really super, super excited to get this thing going. There’s something to be said for people coming together after they’ve run the gamut of the music business, experiencing the ups and downs of it. How has that facet lent itself to the functionality of the band? If I was thrown into this thing when I was 17 years old, I would’ve handled it much differently. When you’ve been through it and you really understand the industry, really you kind of learn to respect it and really appreciate the chances and opportunities that are given to you and that you earn. I think being where we’re at and we’re all into our 20s now and we all have that respect for the industry, have that respect for the opportunities that we’re given and we do not take them for granted and I think that we’re ready for this now. Would I have been ready for this when I was 16 or 17 years old? No, and I think there’s something to be said about that absolutely. Speaking of opportunities, tell me how you got the opportunity to sing on this song “Over It”. I got a call obviously from Tech to come down and do this track. He heard what we had going on with Above Waves and from what I understand he had to have this on his track. He flew me down to the beast that is Strangeland and got up there and it was just a great experience. It was really funny because I’m a pop artist and jumping into this hip hop world and in doing that you’re basically jumping into Tech’s brain. It’s just been an amazing experience getting in there. Tech, obviously you know him, he’s a character man. Really it’s funny because being in the room with him and working with him, it’s like he’s a different person. When you hear him on a record it’s like he is his emotion, he is his feeling at that time and in that song. It’s just really interesting hanging out with him as a person and being with him as a person. It’s like he transforms based on the way he’s feeling or based on that song. It’s an incredible thing to experience and be around so for me it was great. Long and short of it is he just invited me down and we collab’d on this song. I think it’s killer. I think it’s a great track. I think people are going to connect with it, especially because it just speaks so well as to where we’re at in the music industry right now. When you heard the track were his verses on it or was it just a bare track? Basically Seven sent me the track and Tech already knew exactly what he wanted to do. He knew exactly what he wanted to say with the song and it certainly spoke to me when I got the track. I knew it was something special and I knew it was something that Tech was throwing himself fully invested into. He had a vision for it and he knew where he wanted to go with it so it really wasn’t hard to organically build it from there. You know how Tech is, he speaks his mind and he speaks from his heart. He doesn’t hide anything. I mean you have to look at where the music industry is right now. You look at 50 percent of the artists that were nominated in one of the Grammys were independent. That says something right there and what Tech has done for the industry right now and what he’s doing – he’s pioneering this and certainly also from a music standpoint. It’s just incredible what he’s been able to do and this song is really, that’s what this encompasses right now. It’s like Tech and Strange, and maybe even Above Waves, we all have this opportunity right now to shape the way the music industry is going to go moving forward. I think it’s a great representation. That’s what this song is. Tech has taken over the hip hop industry and he’s done it on his own. He didn’t need a major label behind him. He had Strange and he had himself and he went forward with this thing and he’s still on it and he’s still shaping this industry. He’s been it. The longevity speaks for itself. That’s what the song is. It’s obvious what he’s saying on this track and I’m honored to be able to help convey that message to the masses. 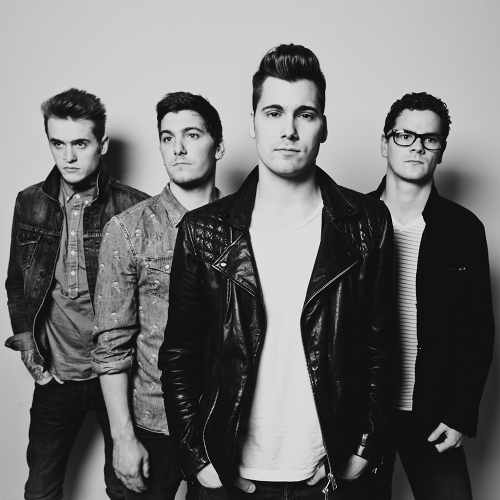 – What do you think of “Over It” and Ryan Bradley’s chorus?